Glyterra-gL Day and Night Kit Review (2018): Worth Buying? Glyterra-gL Day and Night Kit Review: What it does? Glyterra-gL Day and Night Kitis two way formula for day and night. Read Glyterra-gL Day and Night Kit review to knowwhatitdoes? andhow it help your skin? There are a host of things that causes your skin to wrinkle which includes factors that are both within and outside of your control. That includes aging, heredity, stress, personal outlook in life, and lifestyle choices. Diet is certainly an aspect of your life you want to watch if your objective is to minimize the effects of poor diet choices to skin aging. High sugar content in your diet and cause the skin cell damaging Advanced Glycation End Products or, AGEs, which result from glycation. 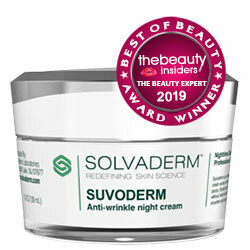 This process attaches sugars to proteins in the skin, including collagen and elastin, which eventually overwhelms the protein molecules, leaving skin saggy, wrinkled and dull. That’s why besides making sunscreens a must-have in your day time skincare routine, you must also incorporate a product that helps you prevent and inhibit glycation, just like Glyterra-gL Day and Night Kit. Avoiding glycation is not as simple as ridding your diet from sweet food and drinks because everything that you eat can turn into sugars inside your body. Glyterra-gL Day and Night Kit is manufactured by San Medica International, the same company behind SeroVital which is made of growth hormone. It claims that this product works two ways. 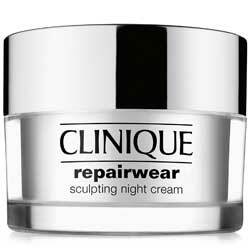 First, it acts on sugar-damaged skin cells to help restore skin firmness and ample degree of elasticity that helps it resist damage. Second, it protects skin from further glycation-induced damaged. 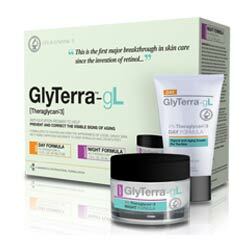 Glyterra-gL Day and Night Kit is sold at $135 a pair. Day Cream: Water (Aqua), Butylene Glycol, Glycerin, Betaine, Glyceryl Stearate, HordeumDistichon (Barley) Extract, Helianthus Annuus (Sunflower) Seed Oil Unsaponifiables, Behenyl Alcohol, Cetearyl Alcohol, Isododecane, AlbiziaJulibrissin Bark Extract, Theobroma Cacao (Cocoa) Seed Butter, Silica, PhytosterylIsostearate, Dimethicone, Santalum Album (Sandalwood) Extract, PhellodendronAmurense Bark Extract, Saccharomyces Cerevisiae Extract, Algae Extract, PisumSativum (Pea) Extract, Aloe Barbadensis Leaf Juice, Ammonium Acryloyldimethyltaurate/VP Copolymer, Erythritol, DimethiconeCrosspolymer, Urea, Glucosamine HCl, Xanthan Gum, Pentylene Glycol, Sorbitan Laurate, Caprylyl Glycol, Bisabolol, Allantoin, Niacinamide, Hydroxyethylcellulose, Acetyl Dipeptide-1 Cetyl Ester, Carbomer, Sodium Phytate, Disodium Adenosine Triphosphate, Sodium Hyaluronate, HomarineHCl, Oligopeptide-68, Disodium EDTA, Palmitoyl Oligopeptide, Palmitoyl Tetrapeptide-7, Sodium StearoylLactylate, Hexylene Glycol, Ethylhexylglycerin, Hydrolyzed Oat Protein, Hydrogenated Lecithin, Sodium Oleate, Citrus Paradisi (Grapefruit) Peel Oil, Tocopheryl Acetate, Polysorbate 20, Phenoxyethanol, Retinyl Palmitate. 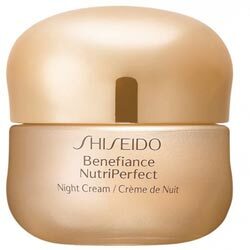 Night Cream: Water (Aqua), Butylene Glycol, Glycerin, Betaine, Glyceryl Stearate, HordeumDistichon (Barley) Extract, AlbiziaJulibrissin Bark Extract, Helianthus Annuus (Sunflower) Seed Oil Unsaponifiables, Behenyl Alcohol, Cetearyl Alcohol, Isododecane, Theobroma Cacao (Cocoa) Seed Butter, Silica, PhytosterylIsostearate, Dimethicone, Santalum Album (Sandalwood) Extract, PhellodendronAmurense Bark Extract, Saccharomyces Cerevisiae Extract, Algae Extract, PisumSativum (Pea) Extract, Melia Azadirachta Leaf Extract, Aloe Barbadensis Leaf Juice, Ammonium Acryloyldimethyltaurate/VP Copolymer, Erythritol, DimethiconeCrosspolymer, Urea, Glucosamine HCl, Xanthan Gum, Pentylene Glycol, Sorbitan Laurate, Caprylyl Glycol, Bisabolol, Allantoin, Niacinamide, Hydroxyethylcellulose, Acetyl Dipeptide-1 Cetyl Ester, Carbomer, Sodium Phytate, Disodium Adenosine Triphosphate, Sodium Hyaluronate, HomarineHCl, Oligopeptide-68, Disodium EDTA, Palmitoyl Oligopeptide, Palmitoyl Tetrapeptide-7, Sodium StearoylLactylate, Hexylene Glycol, Ethylhexylglycerin, Hydrolyzed Oat Protein, Hydrogenated Lecithin, Sodium Oleate, Citrus Paradisi (Grapefruit) Peel Oil, Tocopheryl Acetate, Polysorbate 20, Phenoxyethanol, Retinyl Palmitate. Use on skin twice daily for best results. Contains a thick blend of skin beneficial ingredients. Productmaker fails to provide a full explanation of how exactly this product’s ingredients are able to act on sugar in skin. Skincare products, no matter how marketing heavy and low on R&D, have some scientific research where they anchor their claims to, which you need to understand to be able to make that assessment of which products deserve your attention.